Herbaceous PeonyDeciduous rhizome (bulb) that will commonly die back to the ground during frosts. Fu..
Herbaceous PeonyDeciduous rhizome (bulb) that will commonly die back to the ground during frosts. La..
Herbaceous PeonyDeciduous rhizome (bulb) that will commonly die back to the ground during frosts. Fi..
Herbaceous PeonyDeciduous rhizome (bulb) that will commonly die back to the ground during frosts. Do..
Herbaceous PeonyDeciduous rhizome (bulb) that will commonly die back to the ground during frosts. At..
Herbaceous PeonyDeciduous rhizome (bulb) that will commonly die back to the ground during frosts. Se..
Oriental PoppyDeciduous perennial. Low clump of coarse, hairy, grayish-green foliage that dies down ..
Spanish PoppyDeciduous perennial. Low clump of ferny silver-blue foliage that dies down in summer. S..
Candy LilyDeciduous perennial. Clumping habit. Iris like fans of blue green foliage on short stems. ..
Blue OxalisSemi-evergreen perennial. Used as a groundcover. Bright green clover-like leaves. 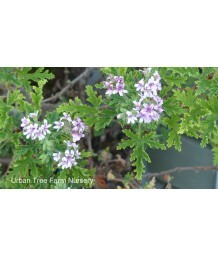 Small b..
Citronella Plant/Cirtrosa GeraniumFrost tender perennial. Deeply lobed, bright green, scented foliag..
Silverleaf GeraniumDeciduous perennial. Grows slowly into a dense mound with silvery gray, heart-sha.. Beard TongueEvergreen perennial. 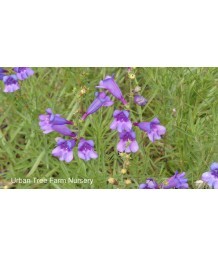 Trumpet shaped, blue violet flowers with white throats start bloomi.. Beard TongueDeciduous perennial. Soft rosy-pink start blooming in spring. Fine green leaves. Great f.. Beard TongueDeciduous perennial. Trumpet shaped, rose-purple start blooming in spring. Fine green le.. Beard TongueDeciduous perennial. Coral flowers start blooming in late Spring. Leaves have a wavy loo..
Azure PenstemonDeciduous perennial. Lavender flowers start blooming in late spring. Small, green lea..
Beadlip PenstemonDeciduous perennial. Reddish-orange flowers start blooming in early summer. Small, ..
Scarlet BulgerDeciduous perennial. Rose-purple flowers start blooming in early summer. Small, green ..
Foxglove PenstemonDeciduous perennial. Lavender-pink flowers start blooming in spring. Striking, dee..
Pensham PenstemonDeciduous perennial. 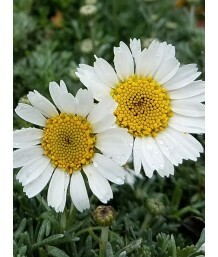 Trumpet shaped, white flowers start blooming in summer. Fine g..
Foothill PenstemonDeciduous perennial. Trumpet shaped, deep blue flowers start blooming in spring. G..
Foothill PenstemonDeciduous perennial. Trumpet shaped, vivid blue flowers start blooming in spring. ..
Foothill PenstemonDeciduous perennial. Trumpet shaped, blue to purple flowers start blooming in spri.. Beard TongueDeciduous perennial. Trumpet shaped, purple flowers start blooming in summer. Deep green.. Beard TongueDeciduous perennial. Trumpet shaped, rosy-red flowers start blooming in summer. Glossy g..
Mountain PrideEvergreen perennial. Trumpet shaped, purplish-red flowers start blooming in spring. Sl..
Palmer's BeardtongueDeciduous perennial. California native. Soft rosy-pink start blooming in spring,..
Parry's PenstemonEvergreen perennial. Low leaves are bluish-green. 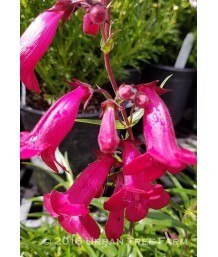 Bright pink flowers bloom in spri..
Rydberg's PenstemonEvergreen perennial. Trumpet shaped, blue to violet flowers start blooming in spr.. Beard TongueEvergreen perennial. 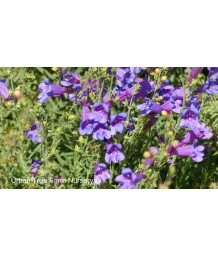 Trumpet shaped, bright bluish-purple flowers start blooming in summ.. Beard TongueEvergreen perennial. Trumpet shaped, bright purple flowers start blooming in summer. Nar.. Beard TongueEvergreen perennial. Trumpet shaped, bright red flowers start blooming in summer. Narrow..
Rocky Mountain PenstemonEvergreen perennial. 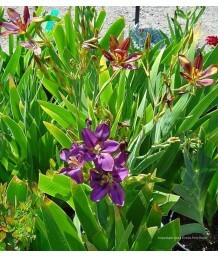 Trumpet shaped, purple flowers start blooming in summer..
Upright Beard TongueEvergreen perennial. Glossy, dark green, almost strappy foliage. 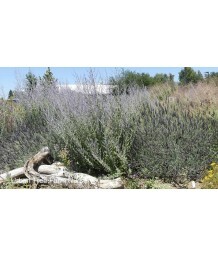 Light lavender,..
Border PenstemonEvergreen perennial. Trumpet shaped, rosy red-purple flowers start blooming in summe..
Border PenstemonEvergreen perennial. 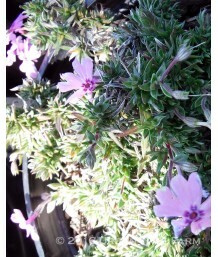 Trumpet shaped, pink and white flowers start blooming in spring..
Border PenstemonEvergreen perennial. Trumpet shaped, reddish-pink flowers start blooming in summer. ..
Border PenstemonEvergreen perennial. 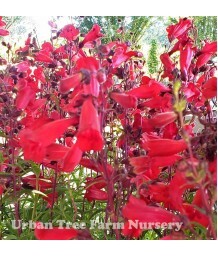 Trumpet shaped, cherry-red flowers start blooming in late sprin..
Border PenstemonEvergreen perennial. 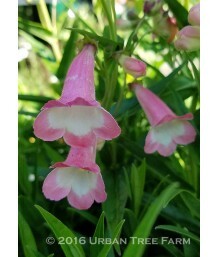 Trumpet shaped, coral pink flowers start blooming in summer. Na..
Border PenstemonEvergreen perennial. 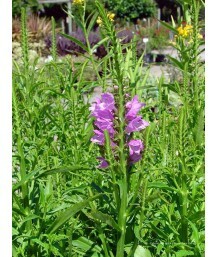 Trumpet shaped, pinkish-purple flowers start blooming in late s..
Border PenstemonEvergreen perennial. Trumpet shaped, red flowers start blooming in late spring. Narr..
Border PenstemonEvergreen perennial. 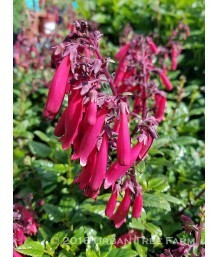 Trumpet shaped, fuchsia pink flowers start blooming in late spr..
Border PenstemonEvergreen perennial. Trumpet shaped, white flowers start blooming in late spring. Na..
Border PenstemonEvergreen perennial. Trumpet shaped, white with a lavender throat flowers start bloo..
Border PenstemonEvergreen perennial. 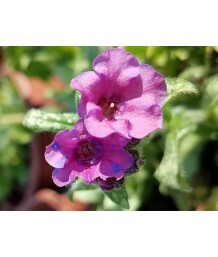 Trumpet shaped, violet blue flowers start blooming in late spri..
Border PenstemonEvergreen perennial. 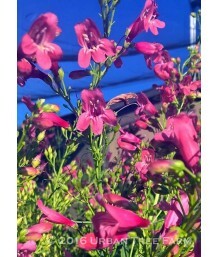 Trumpet shaped, bright pink flowers start blooming in summer. N..
Border PenstemonEvergreen perennial. Trumpet shaped, grape purple flowers start blooming in late spr..
Border PenstemonEvergreen perennial. Trumpet shaped, deep raspberry flowers with white-striped throa..
Border PenstemonEvergreen perennial. 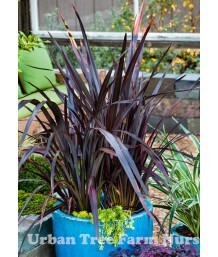 Trumpet shaped, dark purple flowers start blooming in late spri..
Border PenstemonEvergreen perennial. Trumpet shaped, red flowers with white throats start blooming i..
Border PenstemonEvergreen perennial. 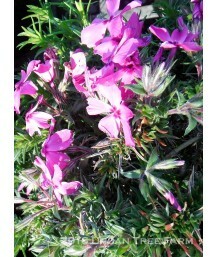 Trumpet shaped, deep pinkish-purple flowers start blooming in l..
Russian SageDeciduous perennial. Aromatic grey-green leaves growing on upright stiff stems give this..
KnotweedDeciduous perennial. Used as groundcover. Deep green, dense, leathery leaves grow into a thi..
KnotweedDeciduous perennial. Can be invasive, spreading by underground rhizomes; or grow in containe..
Woodland phaceliaDeciduous perennial. California native best in light shade. Textured green leaves a..
Scorpion flowerDeciduous perennial. Crinkled gray-green foliage. Purple flowers bloom from spring to..
Reed Canary GrassDeciduous grass. Sometimes called 'Strawberries and Cream'. Upright, rhizomatous ha..
Sweet William PhloxSemi-evergreen perennial. Groundcover, spreading growth habit, spreads by roots. ..
Summer PhloxSemi-evergreen perennial. Mounded bushy growth habit. Large, round, coral red, fragrant ..
Summer PhloxSemi-evergreen perennial. Mounded bushy growth habit. Large, round, lilac-purple, fragra..
Summer PhloxSemi-evergreen perennial. Upright growth habit. 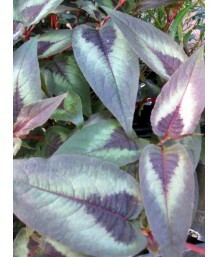 Large, round, mauve/light purple, fragra..
Summer PhloxSemi-evergreen perennial. Upright growth habit. Large, round, pink-purple to white, frag..
Summer PhloxSemi-evergreen perennial. Upright growth habit. Fragrant white clusters of flowers. Bloo.. Creeping PhloxEvergreen perennial. Groundcover, spreading growth habit. Cute, fragrant, pink and whi.. Creeping PhloxEvergreen perennial. Low mounding growth habit. Small, scarlet red flowers. Deep green.. Creeping PhloxEvergreen perennial. Groundcover, spreading growth habit. Deep blue masses of creeping.. Creeping PhloxEvergreen perennial. Groundcover, compact spreading growth habit. Bright pink masses o.. Creeping PhloxEvergreen perennial. Groundcover, spreading growth habit. Deep pinkish-rose masses of .. Creeping PhloxEvergreen perennial. Groundcover, spreading growth habit. Deep purple masses of creepi.. Creeping PhloxEvergreen perennial. Used as a groundcover. Small, rich green leaves. Deep crimson flo.. Creeping PhloxEvergreen perennial. Groundcover, with spreading growth habit. Small scarlet-red flowe..
PhloxDeciduous perennial. Sometimes sold as an annual. Clusters of tiny, green, pointed leaves form ..
Mountain FlaxEvergreen shrub. Bold 2 1/2 inch wide arching crimson red leaves with darker red margin..
New Zealand FlaxEvergreen shrub. Slow growing. Forms clump. Upright arching leaves are pinkish with ..
New Zealand FlaxEvergreen shrub. Slow growing. Forms clump. Narrow upright blade-like leaves are gre..
New Zealand FlaxEvergreen shrub. Slow growing. Forms clump. Narrow upright blade-like leaves are bro..
New Zealand FlaxEvergreen shrub. Upright habit. Strappy wide shiny reddish brown leaves. Tolerates m..
New Zealand FlaxEvergreen shrub. Moderate rate of growth. Forms clump. Arching strap-like leaves are..
New Zealand FlaxEvergreen shrub. Slow growing. Forms clump. 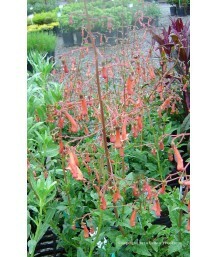 Upright strap-like leaves are reddish br..
Cape FuchsiaDeciduous perennial. 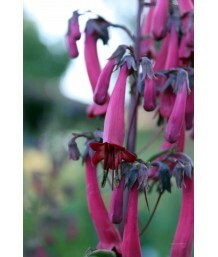 Known for hanging, tubular flowers in summer and fall that are remi..
Cape FuchsiaDeciduous perennial. 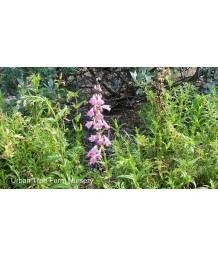 Known for hanging, tubular flowers in summer and all that are remin..
False Dragonhead/Obedient PlantDeciduous perennial. Slender, upright stems carry oblong, toothed gre.. Balloon FlowerDeciduous perennial. Dwarf habit. Gray-green, pointed leaves. Long lasting, large, blu..
Cobweb BushEvergreen perennial. Finely textured gray leaves form a low spreading mound. 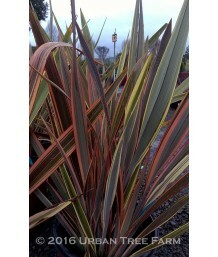 Can get tall..
Variegated Jacob's LadderDeciduous perennial. 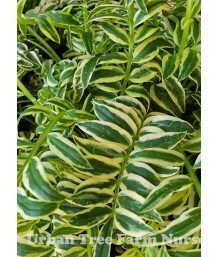 Green and creamy-white variegated, pinnate foliage app.. Giant Solomon's SealDeciduous perennial. Large, bright green, broadly oval leaves. Bell-shaped, gree..
Solomon's SealDeciduous perennial. Long, thing green leaves on slender stems. Bell-shaped, soft oran..
Solomon's SealDeciduous perennial. Bright green, broadly oval leaves with creamy-white edging. Bell-..
CinquefoilDeciduous perennial. Fuzzy, serrated, bright green leaves look almost like a strawberry pl.. Strawberry CinquefoilDeciduous perennial. Deep green, mounding, fuzzy foliage with toothed edging. V..
CinquefoilDeciduous perennial. Mounded clump of light-green slightly toothed leaves. Flat flowers ar..
CinquefoilDeciduous perennial. Prostrate, mat-forming habit of spicy-scented, strawberry-like, shiny..
Blue Star CreeperEvergreen perennial. 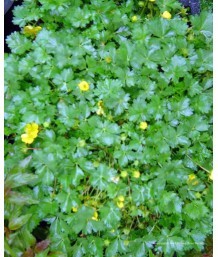 Bright green, nearly stemless leaves form a spreading mat. Tin..
White Star CreeperEvergreen perennial. Bright green, nearly stemless leaves form a spreading mat. Ti..
Self-Heal, Heal-AllSemi-evergreen perennial. Creeping habit; spreads by runners to form low dense fo..
LungwortDeciduous perennial. Elliptical, apple green and silver leaves. Small clusters of violet-blu..
Lungwort/Bethlehem SageDeciduous perennial. Elliptical, medium green, fuzzy, silver spotted leaves. 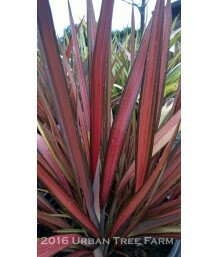 ..
Bromeliad speciesEvergreen perennial. Rosettes of recurving, spiny-margined, light green leaves are ..
Bromeliad speciesEvergreen perennial. 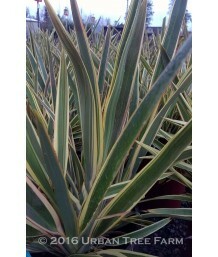 Narrow silvery-green spine-margined foliage grows in dense tuf..
Bromeliad speciesEvergreen perennial. Compact foliage forms bright green rosettes. Lime green bell-l..
Moroccan DaisyEvergreen perennial. Forms low, dense hummocks. Tiny gray foliage is crowded around sh..